Clip Studio Paint has an awesome brush engine. However, their documentation is not super user-friendly, unless video tutorials or super long manuals are your thing. So, here we are. Here's a quick tutorial on how to install new brushes in Clip Studio Paint. If you want Smith Micro's old tutorial, you can view it over on YouTube. There's a bunch of places you can get brushes from if you don't wanna go through the Clip Studio Assets site. They're usually in .sut format. 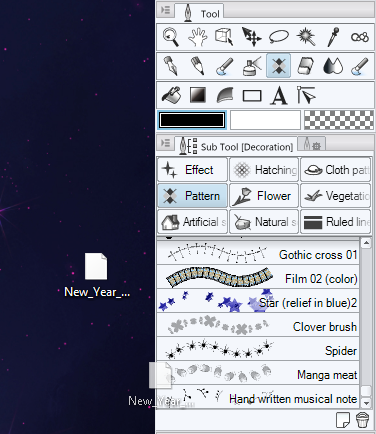 In Clip Studio Paint, make sure your desired tool panel is open. In my case, I've downloaded a brush meant to be in the "Pattern" section, so that's what I've selected. You can also do this with more than one brush file. Assuming everything went okay, it should be available to use! 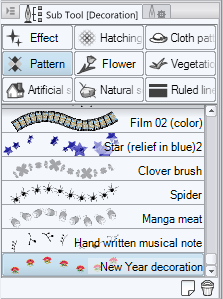 Alternatively, you can use the "Import Sub Tool" option that's outlined in the Clip Studio Paint User Guide. 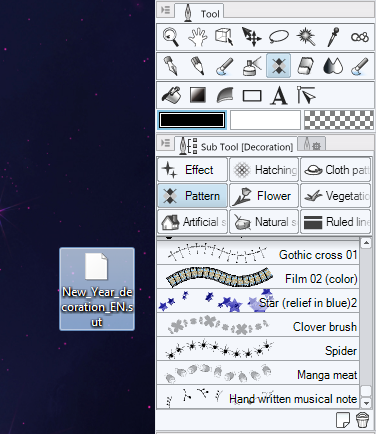 What's cool is that if you don't like the current organization of your brushes and materials, you can drag and drop them into different sections, or to create new brush options if you choose!